Riven By Fire And Fiery Rhetoric, Venezuela Decides Its Future In The Streets : The Two-Way President Nicolas Maduro is pushing for a new constitution — but protesters are pushing back. As the political tug-of-war unfolds, violence and international criticism continue to escalate. Hooded demonstrators equipped with helmets, gas masks and makeshift shields face off against riot police during a protest in Venezuela's capital, Caracas, on Wednesday. Warning: This post contains graphic photographs and video. While President Nicolas Maduro has set the gears in motion for a new Venezuelan constitution, the confusion and violence that has engulfed city streets for more than a month only appears to be deepening. The tumult continued apace this week, opening Monday with Maduro's call for a new law of the land and culminating with a women's march — a white-clad gathering in the capital Saturday to protest the president's proposed changes. The near-constant clashes between protesters and riot police have pushed the death toll even higher over the past month, to at least 36 by Reuters' count. The latest victim appears to be a student shot dead Thursday in the northern state of Anzoátegui, where his shooter managed to escape on a motorcycle. In all, the news service reports that more than 1,700 people have been arrested — 597 of whom were still jailed as of Thursday — since activists first took to the streets in early April to protest an attempt to nullify the National Assembly, a legislative body packed with lawmakers who oppose Maduro's policies. That attempt was quickly walked back — but not before it catalyzed an opposition that had already been simmering over rampant food shortages and indefinitely postponed elections. 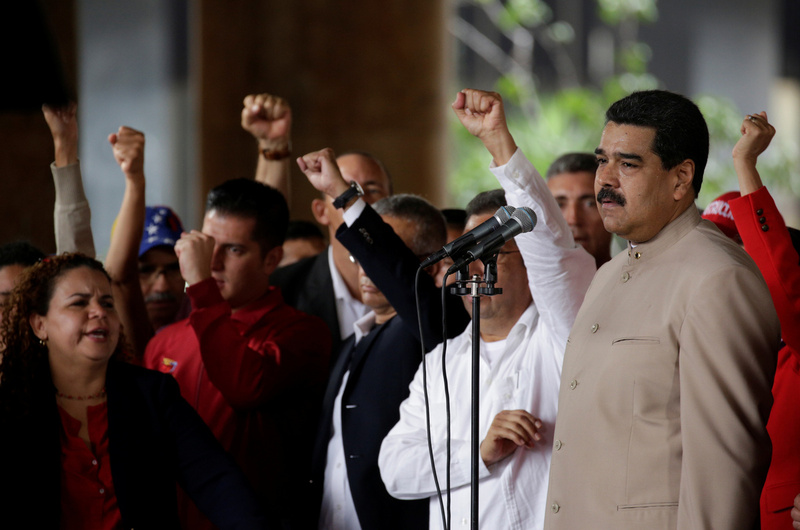 Now, Maduro hopes a revised constitution will spell an end to the unrest, which he sees as a plot hatched by enemies both domestic and abroad to undermine his government. Venezuelan President Nicolas Maduro pauses during a speech Wednesday in which he called for a constituent assembly to decide changes to the country's constitution. "I see congress shaking in its boots before a constitutional convention," he declared Wednesday outside the National Electoral Council, delivering a decree that opened the process to create a new constituent assembly. NPR's Philip Reeves reports that such an assembly — which won't be elected by a popular vote — "will have the power to rewrite the constitution, including election rules." That would be convenient for Maduro, who has repeatedly delayed or canceled elections since a 2015 vote catapulted the opposition to a strong majority in the National Assembly. 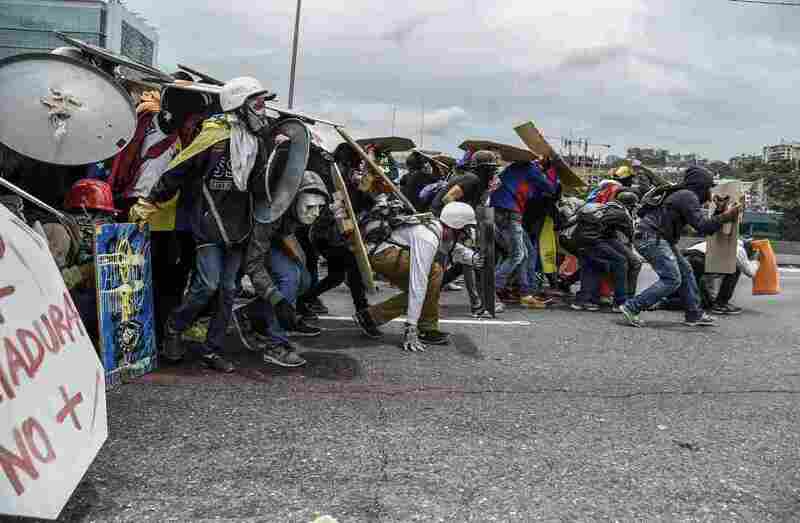 (Top) Students from the Central University of Venezuela confront riot police during a protest in Caracas on Thursday. (Bottom left) A student throws a stone at riot police. (Bottom right) Opposition activists assault and set fire to a National Guard riot control vehicle during a protest on Wednesday. Beyond these few details, however, The Associated Press notes that Maduro has been vague about what he plans for his revisions, which would cut up a founding document of his predecessor and mentor Hugo Chavez's regime. Still, one thing has been clear: Opposition activists are deeply opposed to the move, viewing it as, at best, an attempt to distract from the upheaval that's seized the streets of Caracas and other major cities — or at worst, a bald-faced maneuver to shore up dictatorial powers for himself. And that displeasure has been evident in confrontations between protesters, dressed in gas masks and bearing makeshift medieval shields, and riot police with armored vehicles and shields of their own. As some demonstrators lobbed rocks and molotov cocktails, law enforcement has countered with increasingly violent tactics — including one videotaped incident in which a flaming police vehicle plowed into a crowd of protesters on their way to the National Assembly. That wasn't the only image to go viral this week. On Wednesday, a protester suffered serious and extensive burns after catching fire when a motorcycle exploded nearby. The violence in the streets has drawn criticism from beyond Venezuela's borders, as eight Latin American countries signed on to a letter condemning the actions of Maduro's government. 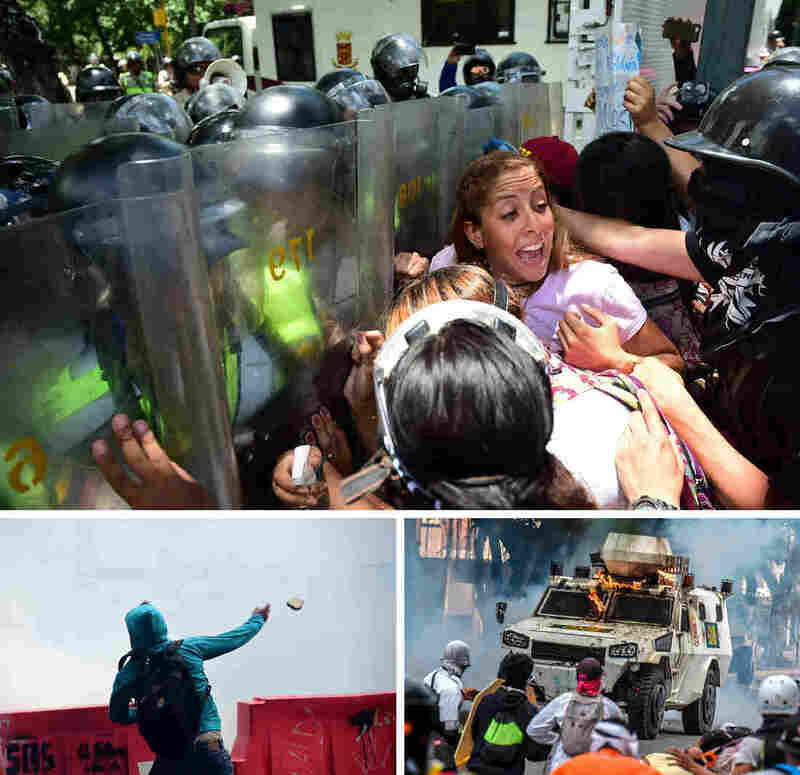 "We condemn the excessive use of force by Venezuelan authorities against civilians who are protesting government measures that affect democratic stability and cause the loss of human life," the countries said, according to a statement from the Mexican government reported by Reuters. As NPR's Anastasia Tsioulcas reported Thursday, world-famous Venezuelan conductor Gustavo Dudamel also issued an open letter to Maduro, calling on the president "to rectify and listen to the voice of the Venezuelan people. Times cannot be defined by the blood of our people." Within Venezuela's borders, fears among opposition activists are running high — high enough, in fact, for a report that one prominent jailed activist had been hospitalized to set off large-scale protests in its own right. Leopoldo López, who was jailed on a long-term sentence after the last major spate of protests, felt compelled to release a "proof-of-life" video from his cell Wednesday, assuring "my family and my children that I am well." His family, however, were not satisfied. His wife, Lilian Tintori, as well as his mother have sought to maintain their pressure on authorities, maintaining a vigil outside his prison and actively recording the protest on social media. Tintori is also helping spearhead a women's march against Maduro on Saturday, setting up what threatens to be another confrontation between demonstrators and security forces — prologue, perhaps, to yet another week of tumult.